Joonbug is proud to present the inaugural Patrick’s Times Square New Year’s Eve party, sure to ignite New Year’s in NYC. This exciting new restaurant, which was formerly the mega-popular Chevy’s, is unveiling its first-ever family friendly NYE party that’ll shine as bright as Times Square itself. Enjoy Patrick’s delicious premium menu, take advantage of the five-hour open bar, and experience a Times Square NYE like no other. There’s no better all-ages NYE party in Times Square, with a live DJ playing back-to-back mashups of your favorite party tunes. A five hour premium open bar (21+) ensures that the bubbly will flow. As midnight approaches, enjoy the live midnight countdown along with a complimentary midnight toast. The Patrick’s kitchen is quickly establishing itself as one of the hottest in NYC, and you can sample all the best with this menu on offer. For those looking for an ultra-premium night, take out a VIP package that offers premium service. No party on earth beats a Times Square New Year’s Eve – the district is flooded with confetti, balloons, and festive party favors, not to mention people from all over the world looking to celebrate. This is the only way to do a Times Square NYE, as you’ll have the comforts of a restaurant combined with all the excitement of Broadway and 7th Avenue. Located right on 42nd Street a block away from the Ball Drop, Patrick’s is your ticket to the heart of the action. 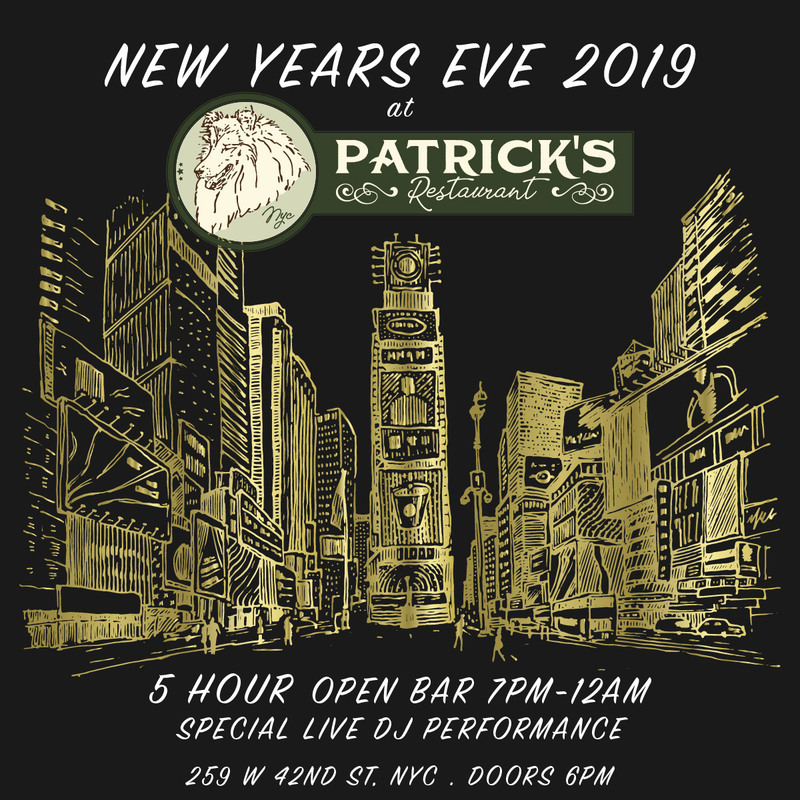 Enjoy a deluxe New Year’s Eve this year at Patrick’s, and see for yourself why this hotspot is taking over Times Square. At the Patrick’s NYE party, you’ll have a night to remember.